In the old days before Radiohead I would take long walks when I couldn’t sleep. This is what I call a Trance Story, a little sound, a little poetry, a story to tell. Take a walk. Steal some roses. Plans are what happens if you’re lucky. I didn’t get to see Atoms for Peace in Santa Barbara. There was a small crisis involving a left turn accident and insufficient funds to rent a car. . But I did get to see them at the Hollywood Bowl. So I was lucky. I went with a friend who is about to turn 71. Although she consistently calls Atoms for Peace Radiohead and tells me that she is going to get Thom to give her a hug one day, her enthusiasm for the music is genuine and amazing. She has a highly syncopated soul. We spent some time near the backstage gate because we happened to park beside it. We talked to some fans and some guards and staff. Everyone was friendly and you somehow felt more connected to a family, which Radiohead fans definitely are. When we arrived someone was just taking delivery of a guitar that Thom had signed for charity. Pretty thing. And I sent Flea a wristband as a present on a whim with my eye fetish on it. Who knows if he got it, but it’s the thought that counts. Oh and I got a good snap of Mauro giving the high five to one of the fans, Ian, who wished him a happy birthday. Thom came out and hovered in conversation with a guy for a while, and you somehow knew he was there, he has an energy even from a distance that is palpable. As if someone had thrown something into a pond and the ripples were reaching out from him as the center. Eventually we went inside. My friend listened to half the concert with her eyes on the boys, saying from time to time, “That bass player is the bomb diggity.” And , “Look at them moooooooove!” And she also said quite seriously “This is a turning point for popular music. They’re just changing the direction of the whole thing like when the blues turned to rock and roll.” Did I mention she’s a classical pianist? Did I mention she is seventy years old. I can’t imagine having a better companion for the show. She listened to the other half of the show with her eyes closed and she was a sight to behold. “That song took me somewhere,” she said wistfully. Me too. 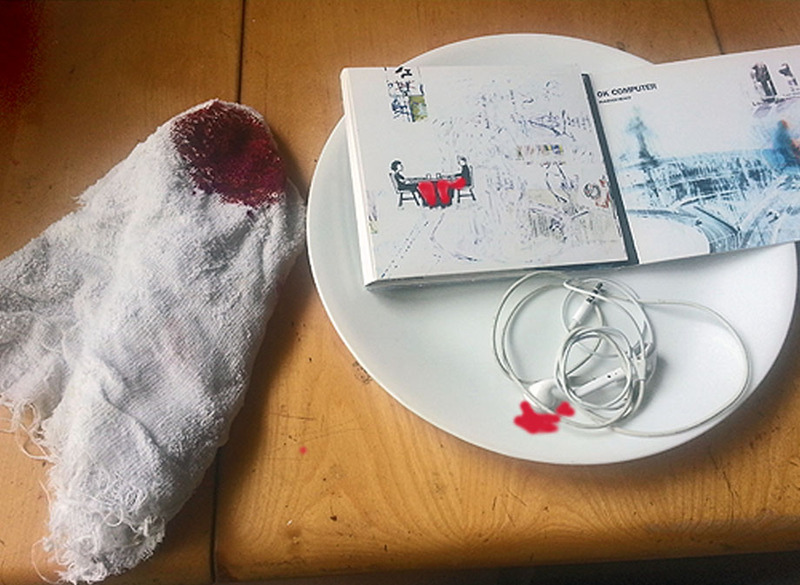 in one of my altered states I tried to eat my headphones. This is getting too weird, even for me. Song? If I could eat it, yeah, I would. The brand spanking new web mag MIddle8, a creation o Soundhalo, has an interesting article in which the author Erin Spens discusses the fact that Atoms for Peace seems to be touring as if, and this is my spin, they were in some kind of disguise through which nobody quite gets who they are or what they are doing together. In any case, the tour is somewhat understated, at least from what I’ve seen. So I wrote an opinion piece about it that I first put on Radiohead.com’s site and I’m reposting it here. All power to Atoms for Peace. It’s of note that Atoms for Peace has still not landed firmly on mother Earth – that is, not a raging topic of musical heat wherever people talk about these things. For my money, the reason that Atoms for Peace is still “under the radar” is that what the band has created is not just something to listen to. Oh, it’s all that, but in fact when these musicians decided to take on what had been created on a computer, they put into the mix that the defining feature of their work is their humanity. By this I mean that the expression of the music isn’t just about the sound in this case, it’s a tribal, personal thing that requires dancing and dodging and hearts beating together. Seeing the people who made this happen. The sweat running down Flea’s fingers when he plays has everything to do with the project. Thom closing his eyes and moving hip to hip brings the finishing piece to what they’ve created. A single man making it perfectly clear that he is doing something that a machine might be the bridge to, but can never have anywhere near the same power or depth of feeling. And we want to feel. Oh how we want to feel. Not just to move to a beat, but to be joined by it to something bigger and more beautiful and more personal. Something that lets us know in the face of any black hole that as long as we are human, we will bring light. I seriously suspect that Atoms for Peace Amok is a musical work that requires this experience. It returns us to something primitive really — what it was to see a musician and a band when we thought of them, however unconsciously, as shamans bringing us a rite of glory and communion. Those who have seen them might not even be able to do justice in words to what it’s like. But this may just be performance art, and without it, nobody can really envision the remarkable achievement of these five men. Pain is a irrefutable part of living a fully realized life. Very few people are in favor of being truly alive so there’s no help from most of them. In fact, they think it’s kind to keep you in an unrealized state of being. You can’t control much I don’t think. Except your choices. But not the results. You can choose not to hurt yourself. It doesn’t mean you’re safe, but it’s what you can do. I cry all the time when I listen to music particularly Radiohead stuff because it’s so beautiful it hurts. This is an old philosopher’s saying, I am probably paraphrasing but I think the philosopher is Nietzsche: “Beauty is the beginning of terror.” We fear its loss the second we find it. And fear is a kind of pain. Cut yourself some slack. Control is an illusion. Beauty is everywhere. It comes in funky takes a while to get into the groove stuff too. And while it can hurt, it’s the only antidote to all the other pain we have. Yeah, life is full of ironies. I do not sleep very much. There are reasons for this that I understand and reasons I don’t. When I can’t sleep I sometimes come to this site. I find it soothing. it supports my theory that there is a universal unconscious, and although I am rarely there, a dream world that we share. We might not meet each other there, but I suspect it’s one big landscape, planet, cosmos. And there are feelings in dreams we never experience when we are awake. Although one night i saw something on the street that was terrifying and foretold of death, and that was like a feeling from a dream. Unencumbered by the editor in my brain. Pure pulse of terror. And I will never know what happened to the people I saw on that precipice of murder. I was simply driving by at the darkest moment of a life, I think. I never dream of Radiohead. I don’t know if I want to. It’s strange enough that they exist in my imagination separately from their own being. As do all of you. And I think, how can anybody sleep when there is something this beautiful to be found when you are awake? You can’t stop, can you? Neither can I, but for me it’s words. Through the pores of my skin. 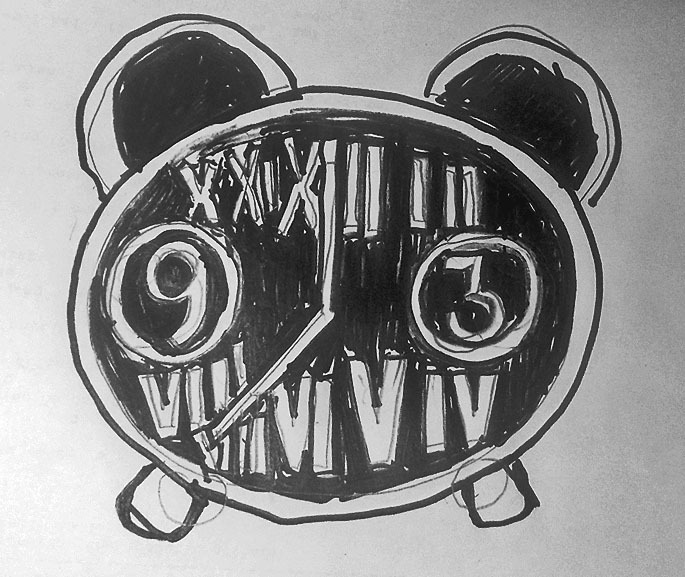 The alarm clock on my phone looks like the Radiohead bear. Is this some secret conspiracy?